MacMillan are a hugely important charity to me. 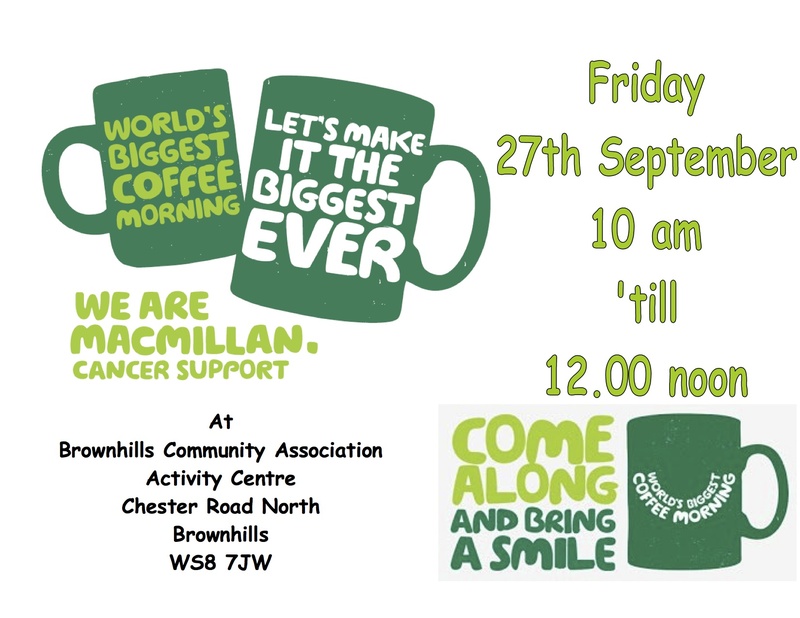 John Fogarty from Brownhills Community Association has been in touch to point out they have an event planned this Saturday 29th September 2018 as part of the Macmillan World’s Biggest Coffee Morning campaign. Their Coffee Morning will take place at Brownhills Community Centre just off the miner island, Brownhills from 10:00am until 1:00pm Saturday 29th September 2018. The function will feature tea, coffee, refreshments, games, entertainments and great company, as you’d expect from a Community Association event. MacMillan are a charity I personally care a lot about: They are hugely important to those suffering with cancer and they do astoundingly wonderful work. Best of luck to all involved, and please do drop me a line to let me know how you all got on. A great charity with fantastic people. This entry was posted in Brownhills stuff, Environment, Events, Fun stuff to see and do, Just plain daft, Local media, News, Reader enquiries, Shared media, Social Media and tagged 2018, 29th September, Activity Centre, Brownhills, Brownhills community association, cancer, charity, Coffee Morning, Events, fundraising, Macmillan, sponsor, support, team, Things to do, Worlds Biggest. Bookmark the permalink.